In its 49th year, the Wastebasket Revue continues to take to the stage to provide scholarships for Osseo Area Schools students. Tickets are $12 for adults, $10 for seniors (65 and older), and $6 for students. There is a discount for the opening night production. Tickets can be purchased online or at the door. Since 1967, more than $1 million has been raised and 750 scholarships awarded. 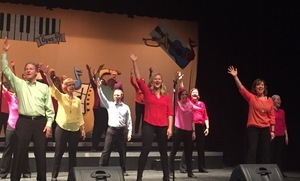 The annual event features current and retired Osseo School District staff along with community members, volunteering their time and talents to create an original music variety show. The funds raised during the productions are used to award scholarships to seniors pursuing post-secondary education.